The eggs are gone from the grocery store. The egg fridge shut down after non-stop egg stocking for days. No, you can’t buy the cartons collected from the broken fridge. You come here because of the labels. The labels don’t tell. I have found compelling reasons to embrace the term animal liberation. Liberation of other animals from human dominion is the clearest expression of animal-rights advocacy. A genuine liberation philosophy—as distinct from a goal of reducing the suffering within industries—champions respect for animals in the places they’ve evolved to inhabit, and requires that we stop fouling, commandeering, and destabilizing our environment. It’s tempting to immediately add: And this will ensure our own survival, too! True, yet a genuine liberation principle makes clear that we are one community among many, not the very point of Earth’s existence. We seem to be scurrying about, suddenly aware that the atmosphere is coming undone, hoping to clean up our act just enough to manage to keep our sense of entitlement over Earth. The point of a genuine liberation theory is a deeper cultivation, a way-finding principle for living among many groups of beings, within the whole of Earth’s living community, with decency and respect. We rush through our days in a society fixated on business, while a civilization-changing crisis unfolds in slow motion. Humans have been pushing Earth’s limits for a long time, and now there are massive infrastructures and administrations pushing at the most hectic possible pace. “What can one person do now?” we think, as we post the latest re-cap from Science Daily and then go out the door to drive to work. Like the waxy wings of a high-flying Icarus, our cleverly manufactured means of support are coming apart. Government representatives hold conventions to debate what must be done to slow the atmospheric effects of our industries. The stakes are immense. Earth’s poles, with their great shelves of ice, are important to Earth’s gravity. If warming water seeps under the Antarctic ice and weakens that gravitational pull, the surface of our planet could be inundated with water. And should global temperatures continue rising at the current rate, tiny undersea plant life could fail to achieve photosynthesis. What most of us haven’t considered before is our reliance on that undersea plant life to supply most of the oxygen in our atmosphere. In short: Earth as a whole ecosystem, with all its splendid biological communities, is straining under the pressure exerted by more than 7 billion humans. It’s impossible to really think about animal liberation without challenging human population growth. The Earth is finite. And it does not belong to the Homo sapiens at the expense of everyone else. If you are still eating cows (flesh or dairy) and other farm animals, it’s incumbent upon you to understand why they are drowning in the midwestern United States…and baking to death in Australia. It’s up to you to understand your part in it, and end at least your part in it. It’s your responsibility to look behind the curtain, and deal with these unnatural disasters connected with the unnatural sprawl that produces those unnatural groceries you so easily toss into your shopping cart. It’s never too late to learn. And you won’t be alone on the journey. This is what I want the average New Yorker on the street to hear on Sunday 14 April. On the day of the Veggie Pride Parade, I’ll have a mic for a few minutes, and dang! Do I know how precious a few minutes of someone’s attention can be! In 1983, Robin Lane, a vegan, left a pamphlet on my seat (and all the other seats) in a concert hall. The leaflet took just a few minutes to read. It changed the world for me. That night I made the commitment to become vegan. The day before, I’d never even heard the word. I appreciate the call to be an audible leaflet for just a few minutes. I share your anguish as we witness what animal agribusiness is doing to the animals in it. What the massive plundering of fossil fuels, former forests, and natural sierras and plains has wrought. The ecocide. The coming apart of the climate. And each day we get up and go out into the world. Kind of, but not quite, like that person who said they’d plant a tree today even if the world would end tomorrow. Sparing the tree that’s already there, we know, is better. Banner image: Public domain (FEMA). Please note: advertisements on this site are not endorsed by VeganPlace. Eventually, with subscriber support, VeganPlace will be ready to make the shift to a paid presence on WordPress so readers don’t have to see the tacky advertisements. On 5 February we enter the Year of the Pig in the Chinese Lunar calendar. Now, Wikipedia tells us, the Japanese zodiac and the Tibetan zodiac do not have a pig; they have a boar. I’m going with the Year of the Boar. Because if we want to get to animal liberation, the ideal to keep in mind is a community of free-living beings. Not beings who were selectively bred to be controlled by the apes known (to ourselves) as Homo sapiens. Decide for yourself. Would you want advocates to represent you this way? Sure, the cut-paper caricature seems happy, but there’s no joy in being born dependent on, and ultimately killed by, a controlling owner. Very few purpose-bred pigs make it to refuges. Those so-called lucky ones wouldn’t need luck if we humans would just stop breeding away their independence. So much for the happy pig motif. Let’s get real. Now look at the banner photo. Free-living boars live and move together, in groups. If the image of young sibling boars evokes a happy feeling in the viewer, it happens in a more respectful context: freedom. Representing pigs as adorably happy in a pet-like state isn’t the best we can do. But it’s what a lot of vegan advocacy does. Here it is, at the most extreme, with this cute little lonely pig. Undomesticated boars live in groups. Babies stick together. So, this image should trouble us and make us question whether what seems “cute” to most human eyes is a profoundly sad state for the animal who’s displayed. And now, are we really going to share a video clip of a helpless baby pig in a bidet for “National Dog Day”? OK, yeah, I’m gonna get preachy here. In the Year of the Pig Boar, how about we focus on these beings’ ancestral, free communities? Most people don’t know what young boars look like, or where they live. We, as vegans, should know. Because veganism is not about making selective breeding seem adorable. Veganism is about challenging it and refusing to obscure the reality of where animal communities come from and who they really are. 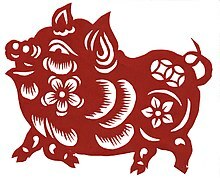 Best wishes to everyone in the Year of the Boar. Let these images of boars interacting set the tone for a new year in vegan outreach. According to Britannica.com, December 26 is the feast day of St. Stephen, the patron saint of horses, so Boxing Day has come to be a day of sporting events, including horse races. The thing that shocked me, along with the chief impact of the whole setup, was that my Uncle George, of whom I thought very highly, was part of the crew, and I suppose at that point I decided that farms, and uncles, had to be re-assessed. They weren’t all they seemed to be, on the face of it, to a little, hitherto uninformed boy. And it followed that this idyllic scene was nothing more than Death Row. A Death Row where every creature’s days were numbered by the point at which it was no longer of service to human beings. Banner photo: Lee Hall. Inset photo: Peter Lloyd, via Unsplash.